New alternative energy sources for homes are becoming more popular as energy costs continue to rise and environmental concerns grow. While many systems are priced beyond the reach of most homeowners, newer technologies have been created to power particular areas of the home. These alternative energy sources help offset the amount of nonrenewable energy consumed by the home. Most sources can work with the local power grid, encouraging the use of alternative energy when it is available, while still allowing electricity use from the grid as needed. 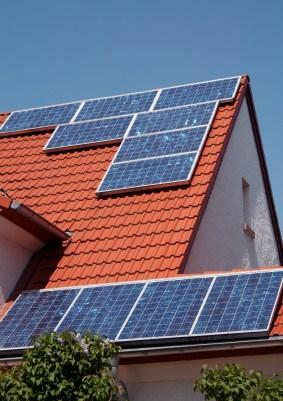 These common alternative energy sources can be used in most residences. Alternative energy sources such as hydroelectricity, tidal power, and nuclear energy are not discussed because they are impractical energy sources for powering a single residence. However, seeking out electricity created from alternative energy sources through your local power company is an excellent option in many parts of the country and should not be discounted. The efficiency of wind energy makes small scale wind turbines a viable option for homes in some areas of the country. Maps that chart wind power will help determine whether or not your particular region has enough wind to justify installing a small scale wind turbine. Most small scale wind turbines are connected to the energy grid. While the wind turbine is producing electricity, the home uses that energy to run. Excess energy is accepted onto the grid by the power company, which must compensate the homeowner for the electricity. When the wind turbine is producing less energy, the home can draw on the power company's energy grid for electricity. Some environmental groups have expressed concern that wind turbines can create hazards for birds and bats. However, studies have determined that this interference is negligible when compared to other common human activities, such as driving. Aesthetics are also an issue: many fear that wind turbines clutter the landscape, ruining views. Geothermal residential heating and cooling is different from geothermal power, which requires drilling deep into the earth's surface. Instead, geothermal heating relies on a pump to circulate water through pipes underground. In the summer the water is cooled, and in the winter, the water is warmed through the natural temperature of the earth. Residential geothermal systems can use either closed-loop geothermal heat pumps, or open loop heat pumps. The closed-loop system, which uses a series of pipes underground that circulate water, is the preferred system. The open-looped geothermal heating system, which requires a well to function, is considered less flexible. Solar thermal technology uses energy collected from the sun to create heat. There are three types of solar collectors: low, medium, and high temperature collectors. Low temperature collectors are used for nonessential heating, such as keeping a swimming pool warm. Medium temperature solar thermal collectors are used to heat water in homes. High temperature collectors are not for residential use, but can be used to create electricity. These collectors are used to create electricity, however, solar thermal should not be confused with solar energy, which uses solar panels to create electricity. Currently, systems that provide energy for an entire home are almost prohibitively expensive for the common consumer. However, alternative energy sources that meet some of an energy efficient house's needs can make a large impact. If you are interested in any of these alternative energy sources, contact a professional who can make recommendations for your home based on your budget and region.